Dalmatian coast… Who can resist the divine appeal of its crystalline Adriatic, its succulent seafood and the intoxicating song of tireless crickets? Most foreign tourists can’t. 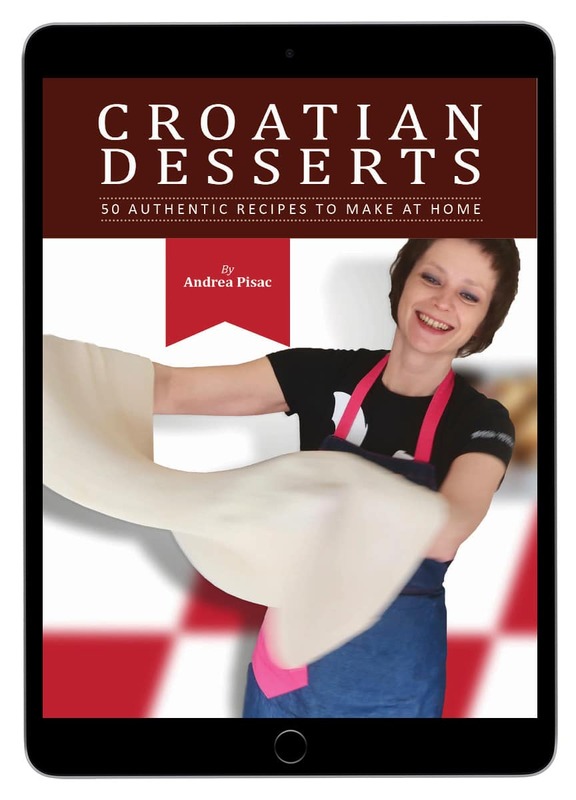 Most Croatians can’t. I know I couldn’t. At least not until I discovered Sinj – a jewel town in the very heart of Dalmatia. 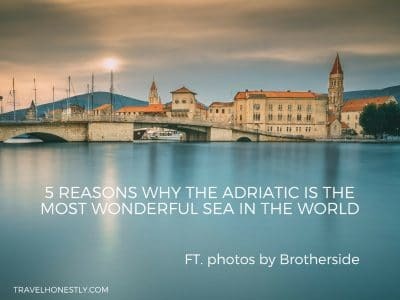 But now that Sinj has my heart, let me give you 10 undeniable reasons why you’ll love it too. For many, Dalmatia is a synonym for the blue Adriatic. Where aquamarine meets gold in the rays of sunshine. But why not open your eyes to more colours of Dalmatia? Like the shades of green reflecting from the fertile Sinj fields. Or the steel grey that glows from the surrounding mountains. The chestnut hues of Sinj Alka horses as they break into a gallop. And the turquoise lustre of the bewitching Cetina River. Sinj town is the heart of Dalmatia, and not only in the geographical sense. Think of the Croatian coastline and its inland as stage and backstage. For centuries, it was the inland (Zagora) that fed the cobbled Dalmatian towns. Brave Zagora people also protected the coast from the Turkish invasions. 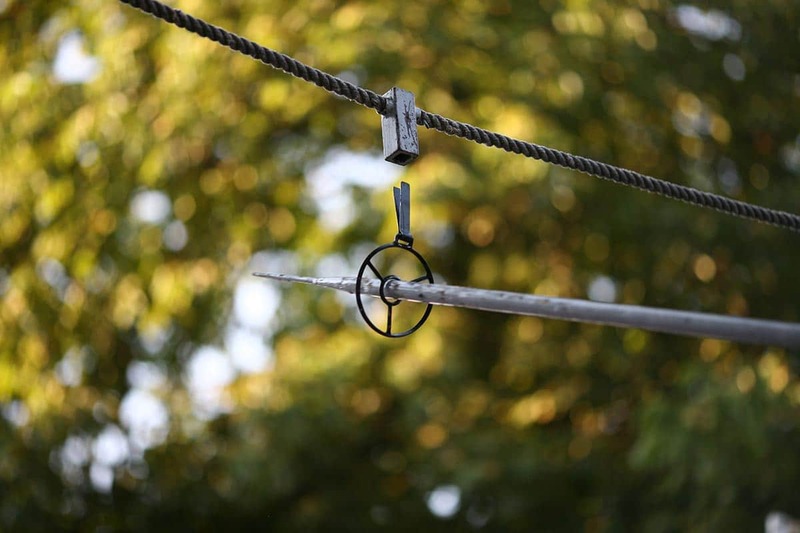 But unless you visit the inland, you won’t see these connections. Just like you don’t see a director when you’re watching a theatre play. 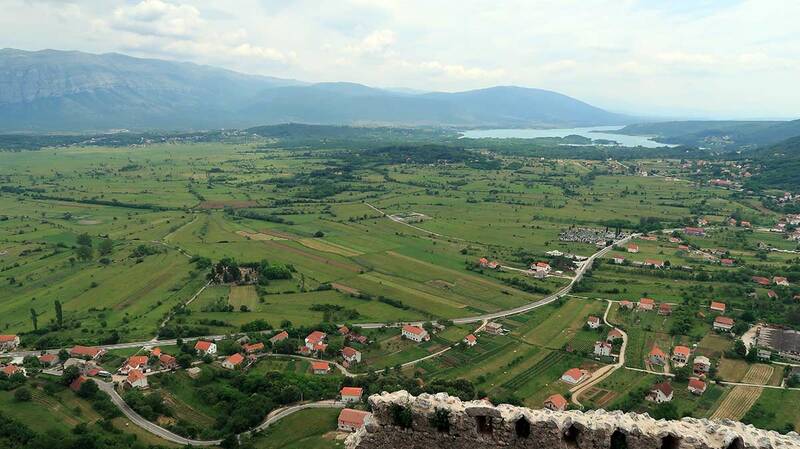 So let me take you on a journey to Sinj – a historic town only 30 km inland from Split. It’s nestled in the River Cetina Valley and surrounded by three majestic mountains: Kamešnica, Svilaja and Dinara. It’s home to the 300 years old Alka knight tournament, which nurtures the tradition of chivalry. It’s where nature shines its glory and miraculous events bring people of all backgrounds together. Sinj has a unique geography. Wedged between imposing karst mountains, the town lies in the vast valley of the Cetina River. Because of the favourable mix of continental and sub-Mediterranean climates, life flourished in and around Sinj since the Stone Age. Among the oldest archeological findings belong to the native Illyrian tribe Delmatae who lived here 2250-1600 BC. The famous food preparing technique peka (baking under the bell jar) is a generous remain of their culture. The Museum of Cetina Region in Sinj keeps rare Ruduša tombstones inscribed with Illyrian names. Go there if you want to dig deeper into the history and archeology of the so called Cetina culture. With so much to offer, Cetina Region was also attractive to the Romans. In the 1st century AD, Roman emperor Claudius founded a colony for the veterans of the 7th Legion in today’s Čitluk. This Colonia Claudia Aequm had all the features of classic ancient urbanism. And though not fully explored, several outstanding Aequm findings speak of its importance. 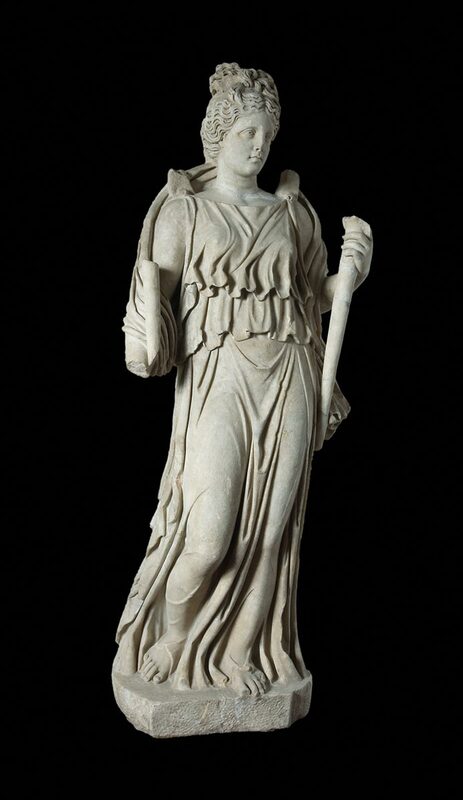 Head to Archaeological Collection of the Sinj Franciscan Monastery to see the gorgeous life-size statue of goddess Diana Lucifera and the beautifully preserved head of Heracles. 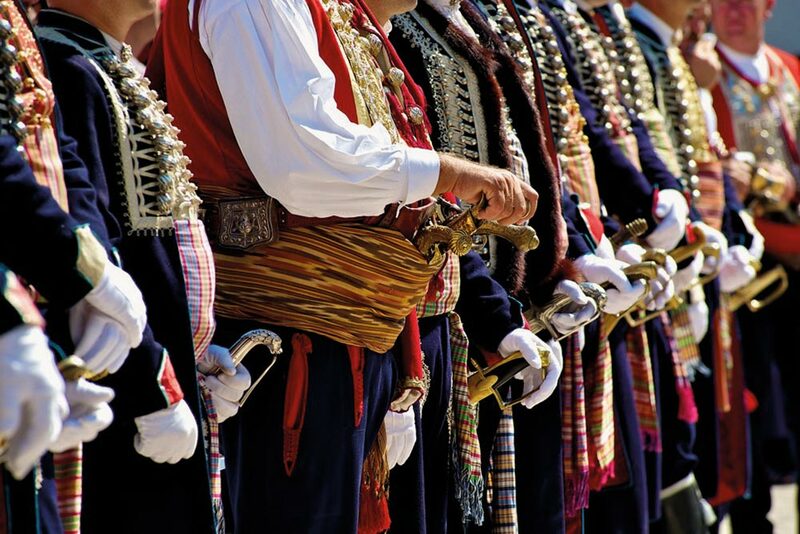 Skipping many centuries ahead, we arrive to the year 1715 – the defining point in Sinj’s history. Around that time the Ottomans plundered the area and were getting ready to conquer Sinj old town. Outnumbered by several thousands Turks, Sinj soldiers miraculously defended the town. The legend says it was the working of the Blessed Virgin Mary. To witness the still living spirit of this victory and the gratitude to the Miraculous Madonna of Sinj, visit Sinj in August. The time for the Sinj Alka Tournament and the Feast of Assumption of Mary. 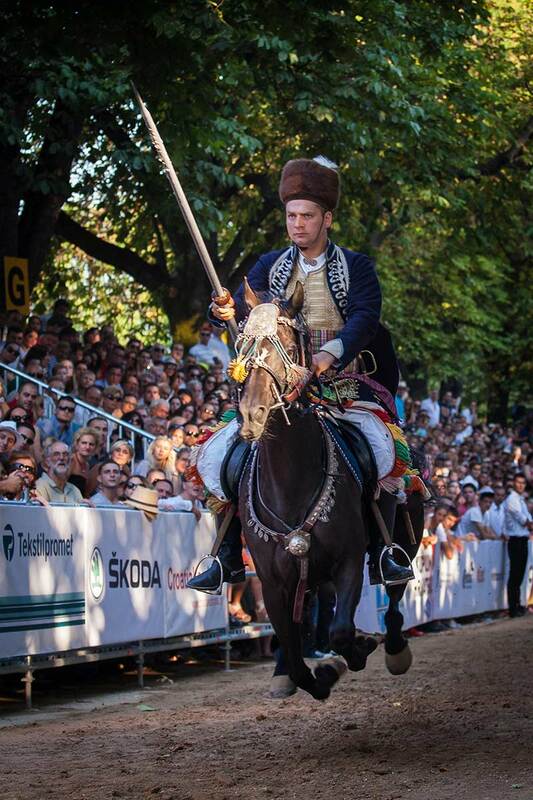 Re-enacted since 1716 in continuity, Sinj Alka is one of the oldest knight tournaments in Europe. It takes place over three days on the first weekend every August. This is when Sinj brims with energy, with its streets welcoming 10 times more people than the town’s population. But Sinj Alka is much more than an event. Its code of chivalry is a standard of honourable character even in everyday lives of the local people. The pride in this tradition is so rooted that no man born outside Cetina Region can become an Alka competitor – Alkar. 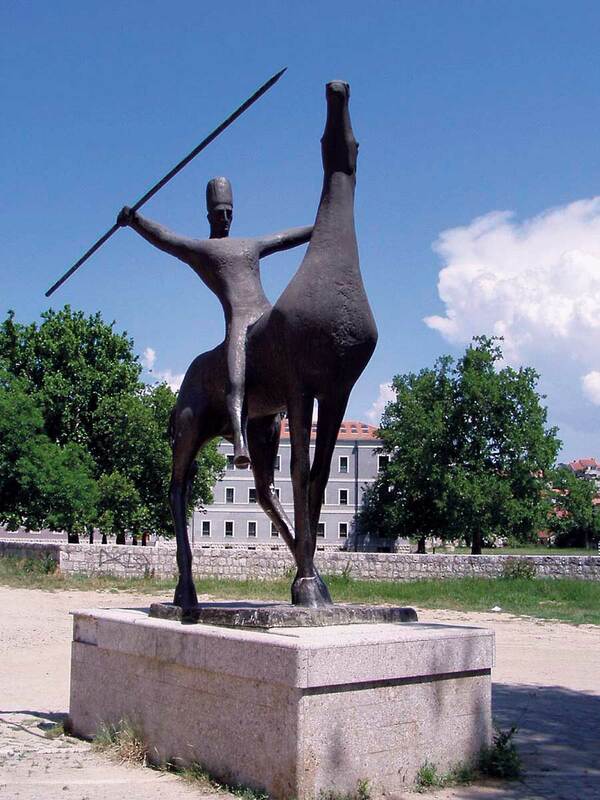 At the same time, Sinj Alka is a profound national symbol of the entire Croatia. Throughout the history, politicians have always acted as Alka patrons. From the Austro-Hungarian kaiser Franz Joseph, the socialist leader Tito to modern-day Croatian presidents. The word alka means a ring or a loop in Turkish. 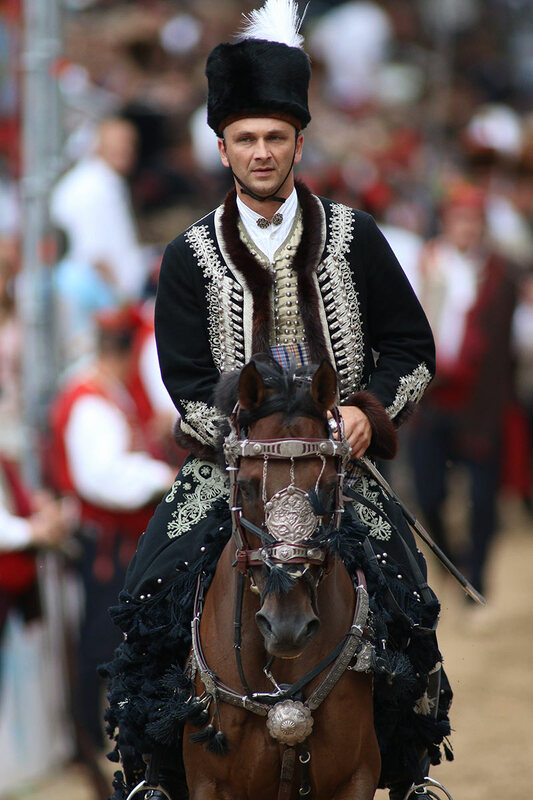 The goal of Alka Tournament is to drive an iron-pointed spier through the middle of alka while riding in full gallop. Each Alkar races three times and whoever wins most points, wins the tournament. The heart of Sinj Alka lies in its historic meaning. As the expression of gratitude to the Madonna and the heroic defenders of Sinj, this 3-day ritual connects past and present in the elaborate ceremony that surrounds the race. The celebration comes alive when Alkars, dressed in the authentic 18th century attire, ride their richly adorned horses in a choreographed procession. They are joined by other men of different ranks and roles and each knows their place. Sinj Alka is a feast for all senses. Witness it and you’ll understand the true spirit of Cetina Region. Just remember to book your tickets well in advance. Or attend races on 2 days leading up to Alka, called Bara and Čoja. They are free and less crowded. Together with Marija Bistrica near Zagreb and Trsat near Rijeka, Sinj is the biggest Marian pilgrimage site in Croatia. 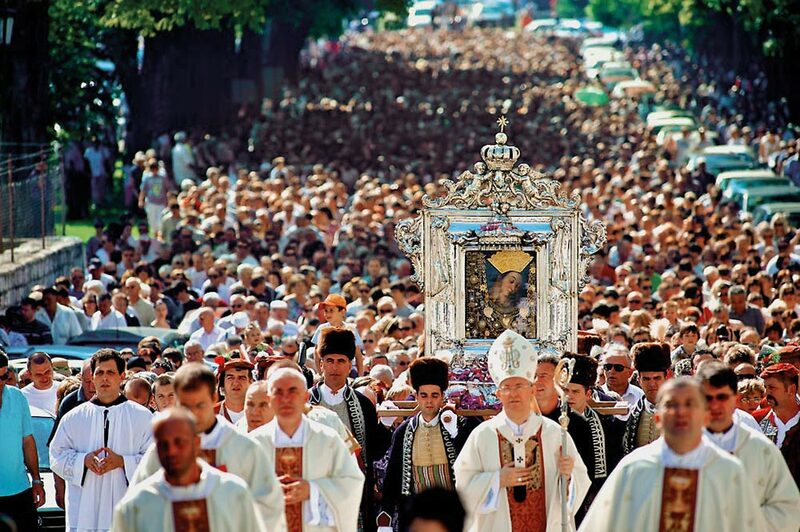 The Feast of Assumption (Sinjska Gospa) held every 15 August attracts more than 200,000 pilgrims. Many devout Catholics from neighbouring areas walk through the night (some even barefoot) to arrive for the mass at dawn. The atmosphere of reverence is particularly moving when the painting of the Madonna of Sinj is carried through the town. This Renaissance painting by an unknown author was allegedly brought by the pilgrims from Rama in Bosnia, when they fled the Ottomans. During the 1715 siege, the Madonna of Sinj ‘appeared in white walking on the walls of Sinj’ and rescued the town from the Turkish onslaught. A year later and as a vow of devotion, the townsfolk donated gold to crown the Madonna’s head. This was when Sinj Alka and the Marian worship became inextricably bound. You can best witness that during the procession when Alkars proudly carry the painting on their shoulders. At all other times, the painting of the Madonna resides in the Church of the Miraculous Madonna of Sinj. 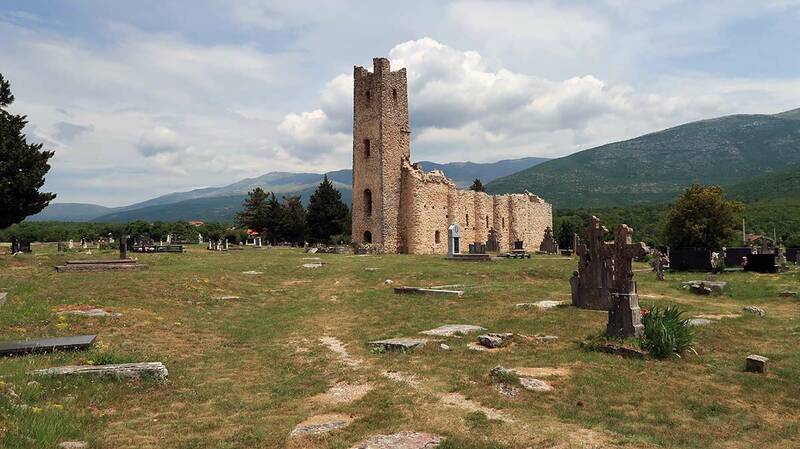 Originating from the 17th century, this imposing church takes centre stage in Sinj town. 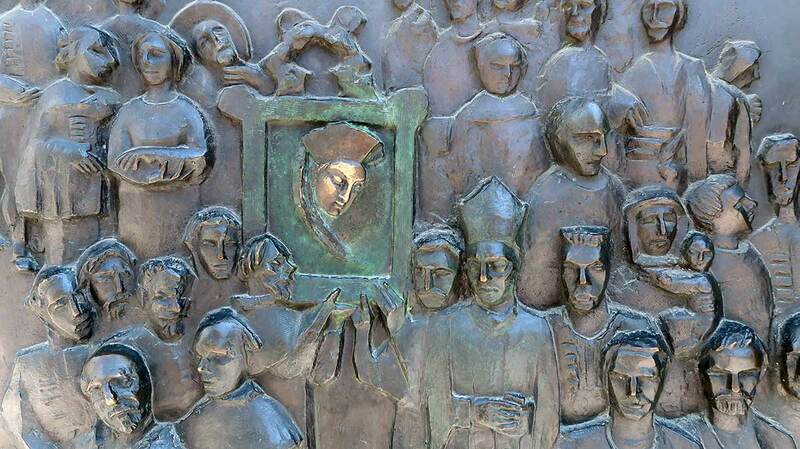 Its bronze door made entirely from a large relief is work of sculptor Stipe Sikirica. The scene portrays the 1715 siege with the meek Madonna watching over her flock. Polished to the brass colour, her head stands out from the relief. This emphasis was not part of the original artwork but it accrued gradually as believers kept touching it during their prayers. Madonna of Sinj still appears on the walls of Sinj old town, but today in the form of a striking statue. To get to it, you will walk past 14 incredible statues that symbolize Jesus’ journey to Calvary. 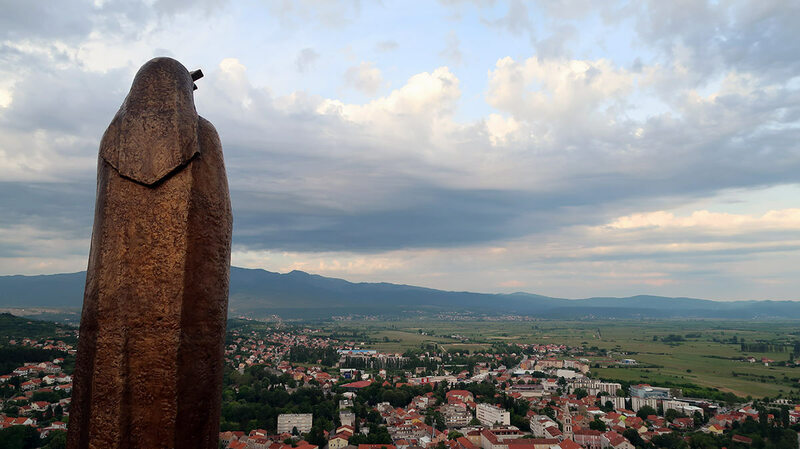 And when you get to the top, your view of Sinj town will be celestial. One of the most impressive buildings in Sinj is Alka Halls (Alkarski Dvori), originally built as the Venetian cavalry barracks. It consists of two u-shaped houses joined by a large inner courtyard. Alkarski Dvori is a shining restoration example. The revamped edifice glows with re-sanded stone which compliments the warm wooden flooring of the interior. This is the seat of Alka Knight Society but also home to the cutting edge Museum of Sinj Alka. The Museum is so immersive you’ll feel as if you’re witnessing the real tournament. The Alka procession is re-enacted with life-size men on horseback chiseled in wood. Every detail, from traditional dress to weapons, is painstakingly realistic, giving the impression of timelessness and eternity. While the real Alka tournament is all about the excitement of the race, the Museum allows you to take a moment and learn about its background. The rich history, the intricate dress and the choreography of the procession. There are countless stories and side rituals that make up Sinj Alka. For example, how women help men to dress, how horses are adorned or how cannons mark the bullseye score. You’ll experience all that through interactive and multimedia exhibits. Alkar Halls also house the beautiful Sikirica Gallery which showcases Stipe Sikirica’s artwork. 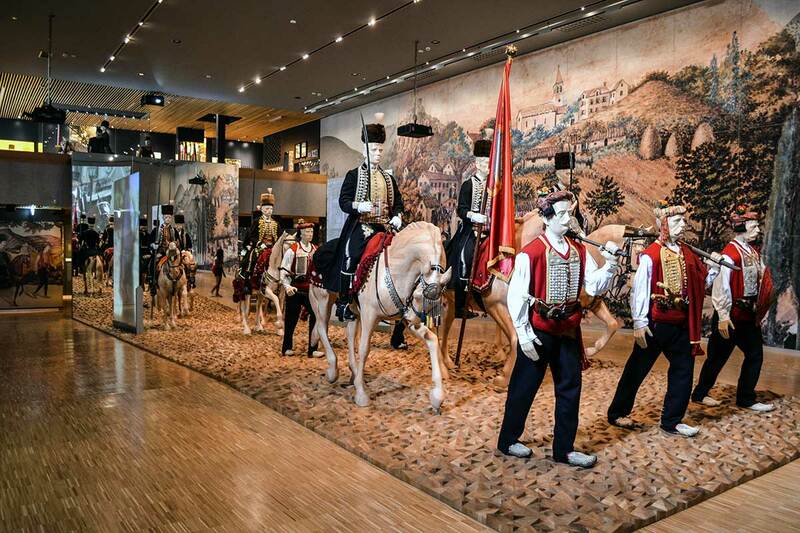 Here you can see his imposing sculptures of horses and Alka participants, but also portraits of famous Croatian artists. Sikirica’s themes are bound with the traditional culture of Cetina Region but his talent is modern and idiosyncratic. The best example of this is the famous Alkar statue which fuses the old with the new, the collective with the personal. This stylized Alkar stands at the beginning of the Alka racetrack. 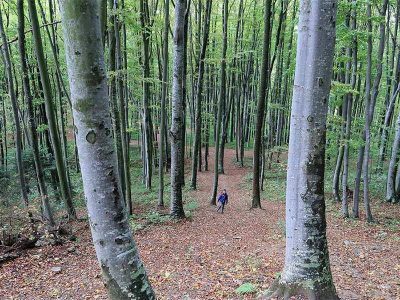 In Sinj, culture and nature are not separate. They flow into each other and the artery that binds them is the Cetina River. This is why the wider area around Sinj is called Cetina Region. 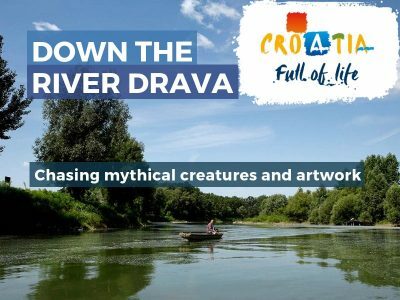 The nicest way to experience this is to follow the river upstream towards Vrlika town. The breathtaking landscape is a tapestry of soaring mountains that line sweeping fertile fields. To catch this view at its most spectacular, climb the 14th century Prozor fort near Vrlika. 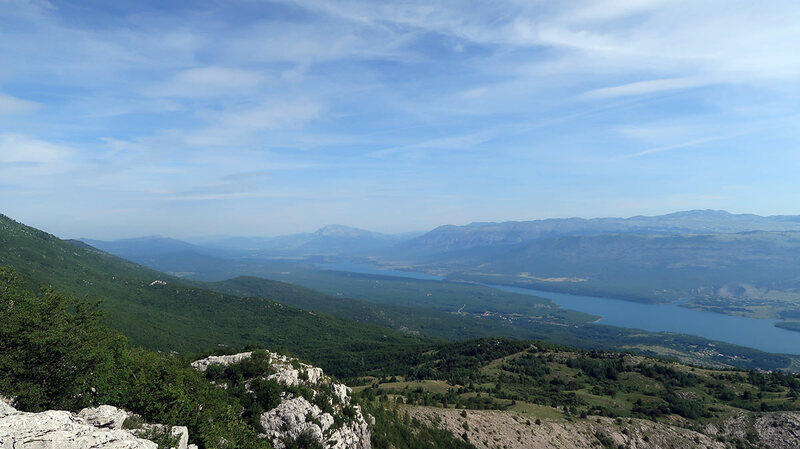 From there the vista reaches across the whole Vrlika Field and the incredibly blue lake Peruća, fed by the Cetina river water. 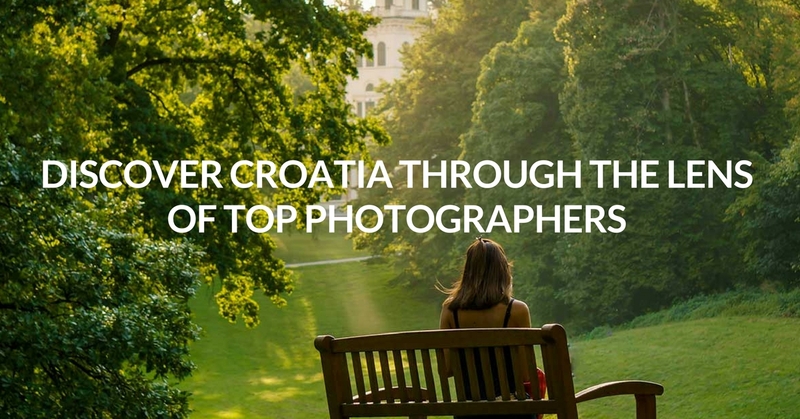 Once you’ve enjoyed this Croatian big sky effect, track down the Česma fountain in Vrlika. 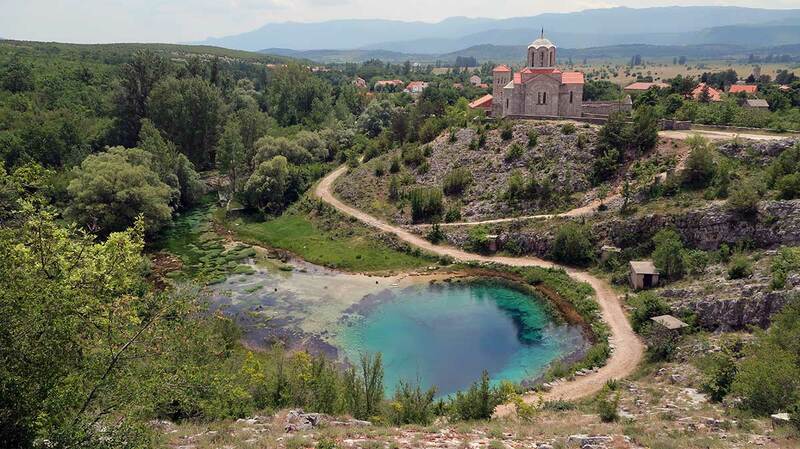 This is the spring of one of the Cetina tributaries, laid out into a round theatre-like plateau. During summer Česma makes a unique stage for the Croatian opera Ero the Joker. Libretto for this popular music piece was written by Croatian writer Milan Begović. You can see his statue among the nearby trees. The opera finale features another singular cultural expression of this region – the silent circle dance (nijemo kolo). 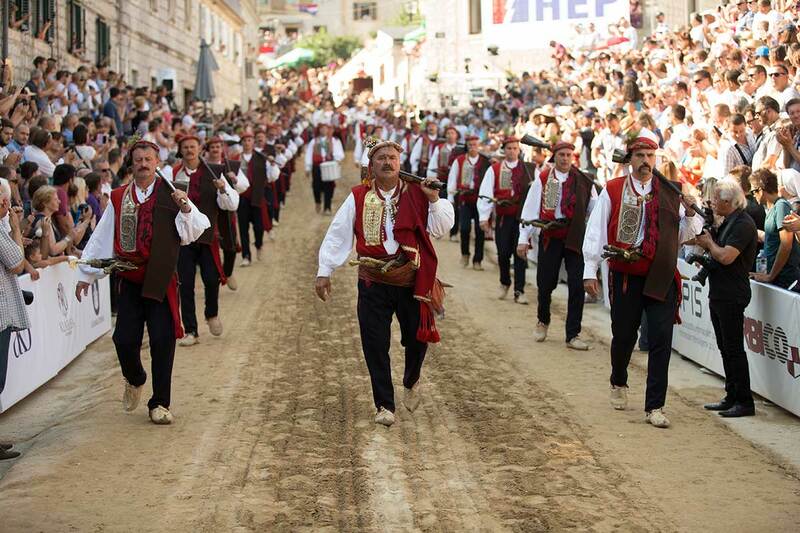 Both Sinj Alka and nijemo kolo are a UNESCO-protected intangible cultural heritage. Further from Vrlika, the Church of Holy Salvation will make a profound impression on you. This 9th century pre-Romanesque architectural gem rises from a wide field in the middle of the medieval necropolis. The so called stećci – megaliths used as tombstones and a UNESCO protected heritage – were a common way to mark graves in Cetina Region. They look particularly impressive when joined together into a bridge. 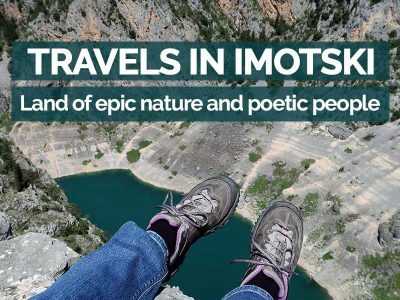 You can see that when you reach the nearby Pločasti most over the Cetina River. With so much wide open space, outdoor adventures in Cetina Region are around every corner. 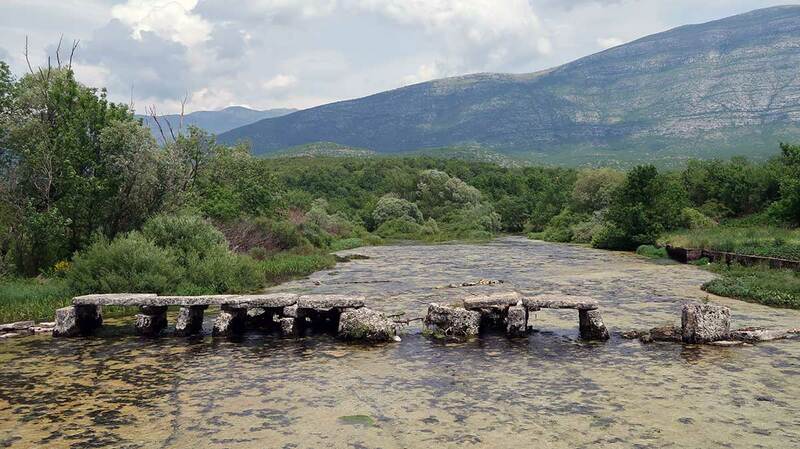 There are numerous cycling trails along the Cetina River, the loveliest one being to its very source. Not only is the journey enjoyable but also seeing the Cetina grotto is a sight to remember. The river actually bubbles from underground, forming the 130m deep lake Glavaševo. The locals will urge you to climb the nearby rock and gaze into its depth. ‘Isn’t is a bit like the Eye of Sauron’, one of them asked me. On your way back, cycle along the eastern bank to have the dramatic mount Dinara towering over you. This karst beauty is a popular hiking destination and if you manage to climb its peak Sinjal (1831 m), you’ll reach the highest point of Croatia. My choice for hiking this time was mount Svilaja, greener and more manageable in the heat of the summer. We climbed to Orlove Stine (Eagle’s Rocks) to admire another spine-tingling view. It seems that Cetina Region is full of them! Mountain areas here are full of unique plants. My favourite discovery was the so called kovilje – a type of grass that resembles a fairy’s hair when joined into a bunch. 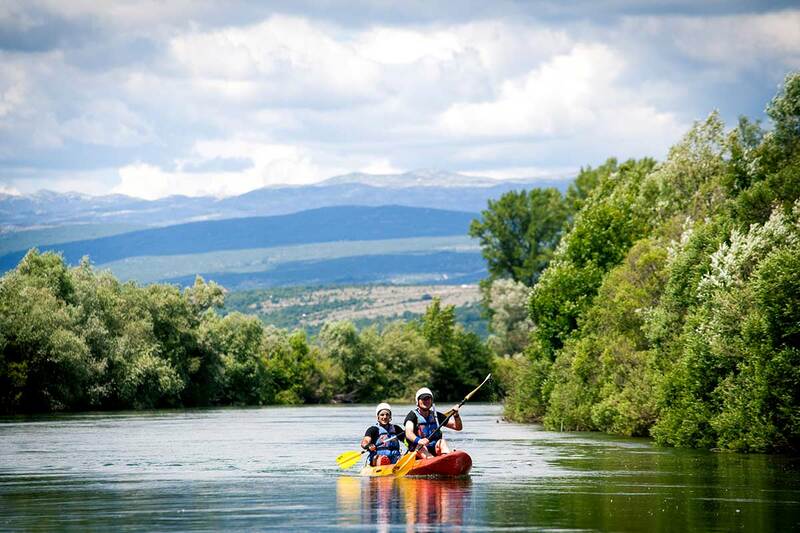 Cetina River is perfect for all kinds of water sports. You can go on a rowing, canoeing or kayaking adventure. Lake Peruća is also great for swimming. And if you follow the river to Omiš, where it meets the Adriatic sea, you can go on the crazy thrilling Cetina zipline. Lastly, horse lovers, prepare for a one of a kind experience. This is a horse country so, of course, you can also explore this whole area on horseback. Once you see an Alkar in full gallop, you’ll be drawn to explore the deep-rooted equine culture of Sinj. Even if you don’t ride, a visit to the Sinj hippodrome and the Alkars’ stud farm is a must. Take a trip inside the stables and mingle with the noble Alka horses. They are meek, inquisitive and easy to pet. As I talked to Stipe Šimundža, head of the stud farm, I learned what makes a horse a perfect fit for Sinj Alka. They need speed and stamina for that striking gallop performance. Physical and psychological composure are crucial to master the choreography – both during the race and the procession. Alka horses are also gentle and can easily adapt to the cheering crowds and the sounds of celebratory cannons. And finally, they are both big and graceful. Just like Alkars themselves. This may be hard to see in the Sinj Alka Museum. But during live performance, the size and the dignified poise of Alkars will definitely take your breath away. When you catch that moment of scoring the bullseye, you’ll know why the Alkar needs to be ‘hawk-eyed and with a strong right hand’. 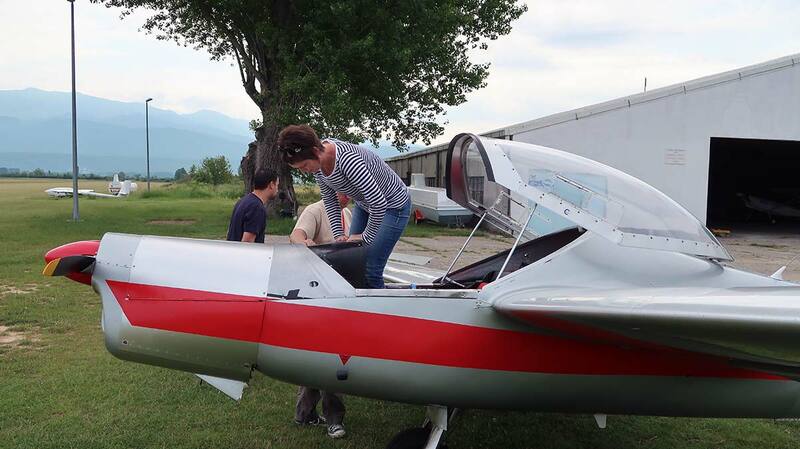 Flying in Sinj is just as important as galloping. Come visit the Sinj Airport Piket which until 1964 was the official airport serving the city of Split. Today the air-base has the gliding section and the skydiving school. You will have most fun if you catch the Alka Skydivers Cup. In this competition, skydivers from all around the world parachute and land on the unique skydiving target – the alka ring. 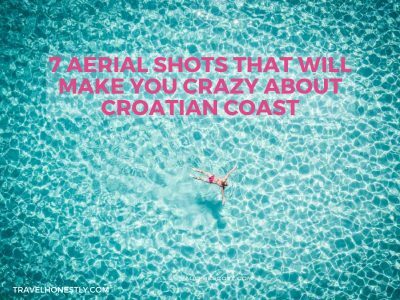 I have been most fortunate to meet Sinj pilots who took me on a heart-stopping adventure – the panoramic flight over Cetina Region. This is when I realized the true character of this part of Croatia. I floated high up above the Cetina River and marvelled at how it pushes through the fields and mountains. I was dazzled by the intensity of colours: fields as ornate as embroidery, colossal rugged mountains showing off their silvery rocks and lush green forests. A single thought came to me, that perfection is a balance between gentleness and harshness. I found this blend of strength and softness everywhere in Cetina Region. And mostly in the local people. 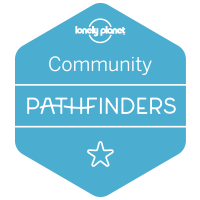 They are known for the heartfelt hospitality and warmth. They are meek and humble in their devotion to the Madonna of Sinj. But the legacy of their fierce courageousness and honour continues till today. I noticed that Sinj food carries the same imprint. This is traditionally a meat country. 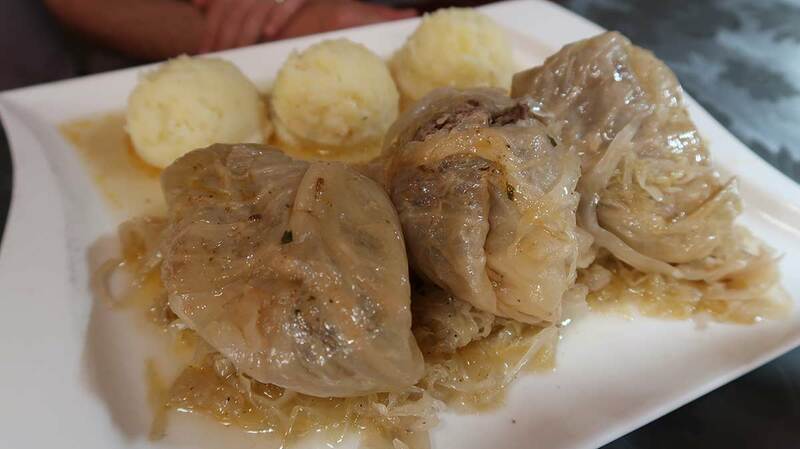 The local speciality Sinjski arambaši resembles the Croatian dish sarma (minced meat and rice wrapped in sauerkraut leaves). But hint at this connection, and the Sinj people will correct you. ‘Arambaši have no rice, only meat’, they’ll say. Peka is a roasting technique that makes veal or lamb fall-off-the-bone succulent. And Sinj pršut (prosciutto) carries a fantastic flavour acquired through the strong bura wind. If you’re a vegetarian like me, you could run into problems in a restaurant. Here, serving meat is an expression of hospitality, a mark of a special occasion. But vegetables are just as abundant – remember the fertile fields? You only need to make a special request! There are several reasons why you should consider spending at least part of your summer holiday in Sinj. First, the climate is a bit different than on the coast. The days are hot and sunny, but the nights are cooler. You will sleep much better. Especially after so much outdoor activity. July and August burst with interesting events. Even if you can’t make it for the exciting Sinj Alka, you have options. You can watch Alkars practice on the racetrack throughout July. Or arrive for the Feast of Assumption to watch them carry the painting of the Madonna. Here is a list of the best summer 2017 events. This is a fun re-enactment of the football match between the native tribe Delmatae and the Romans. In Sinj, there is a small monument to the 7-year old Roman boy Gaius Laberius holding a football, an evidence that Europeans first played football in Cetina Region. 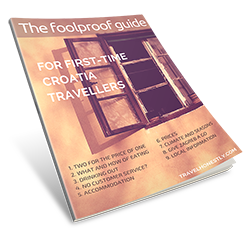 Are you ready to delve into inland Dalmatia? Cetina Region is waiting and it promises to delight. Special gratitude goes to the Tourist Boards of Splitsko-dalmatinska županija and Sinj Town who arranged this amazing journey. 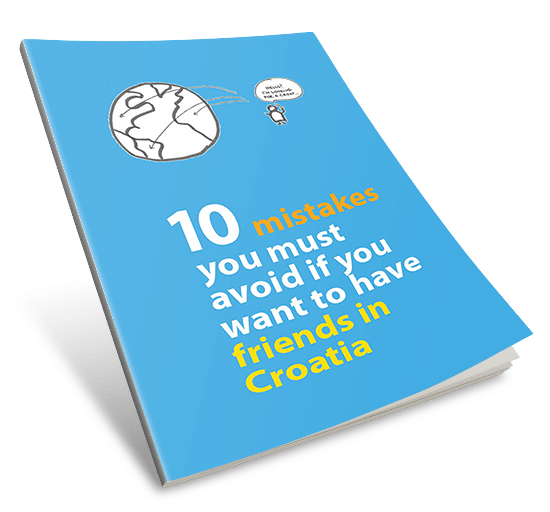 <<–– True Zagreb quiz: how do you and Zagreb match together? Beautiful countryside!!! I think this is the area where my father was born. Thanks for taking me on this trip through the land of my heritage and ancestry!